We are not humans that have animals, we are all animals that have different superior abilities. I got called to this house because a number of neighbors heard a dog wailing and a lot of yelling. I got to the residence and it was pretty quiet. Two more squad cars got there after I did. When I knocked on the door, it was like I walked into the all American home: husband, wife, 2 kids, 2 dogs. No blood. No bruises. No yelling. When I asked if there was anything going on, the couple seemed confused as to why I was even there. As is protocol, everyone was separately questioned. I decided to stay back and see what the officers found. They got the same story…nothing was going on, nothing was the matter. Even the kids said it. I kneeled down and scratched the white dogs head, he had scabs. I pet the brown dog and he dropped tot he floor and peed. The gentleman at the house explained he had a peeing problem.Both of the dogs walked over to the kids who were maybe 6 and 9. The other officers walked the man and woman over to the cars for warrant checks and I talked to the kids. I always keep dog biscuits in my belt…it’s just a good idea. I asked the kids what the dogs names were. We’ll call them “ruff” and “woof”. I asked the kids if “Ruff” and “Woof” were hurt. They told me they has scratches on them because they always tried to get out of the fence. I asked if daddy hurt them. Suddenly, the tears flowed out of their eyes and they told me about one incident of animal abuse after another after another. When I asked why they thought he did this, they said because mommy and they make him mad. That’s all they would say. I explained to the woman that there are services for her. She said nothing. I explained the kids are obviously shaken. She said nothing. I told her the stories that the kids told me. She broke down crying and told me tails of animal, domestic, sexual, and child abuse by the hands of the man who was there. She was scared of him and what he would do to the kids and the dogs if she said anything. Then she showed me the bedroom and the blood and the third dog and her fresh bruises. If it wasn’t for talking to the kids about the dogs, this family’s hell would have continued. Abusers use the animals, abuse the animals, and the rest of the family. More American households have pets than have children. We spend more money on pet food than on baby food. There are more dogs in the U.S. than people in most countries in Europe – and more cats than dogs. A child growing up in the U.S. is more likely to have a pet than a live-at-home father. But even more alarming is that the power and control that abusers use on people, is used on animals first. 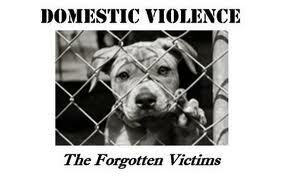 How Is Animal Abuse Related to Domestic Violence? 71% of pet-owning women entering women’s shelters reported that their batterer had injured, maimed, killed or threatened family pets for revenge or to psychologically control victims; 32% reported their children had hurt or killed animals. 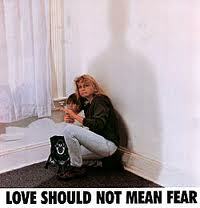 68% of battered women reported violence towards their animals. 87% of these incidents occurred in the presence of the women, and 75% in the presence of the children, to psychologically control and coerce them. Abusers kill, harm, or threaten children’s pets to coerce them into sexual abuse or to force them to remain silent about abuse. Disturbed children kill or harm animals to emulate their parents’ conduct, to prevent the abuser from killing the pet, or to take out their aggressions on another victim. For many battered women, pets are sources of comfort providing strong emotional support: 98% of Americans consider pets to be companions or members of the family. Animal cruelty problems are people problems. When animals are abused, people are at risk. 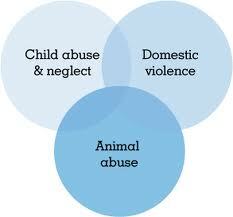 Animal abuse is completely linked to Domestic abuse! An animal abuser WILL abuse people! Animal rights and human rights are interconnected!